Long-time client Sandmeyer Steel Company came to DDA in 2008 with a need for a company calendar to distribute to preferred customers. After careful planning, DDA created a unique design that featured a three month view at a single glance, which gave manufacturers and production planners the ability to look ahead and reference past dates as needed. 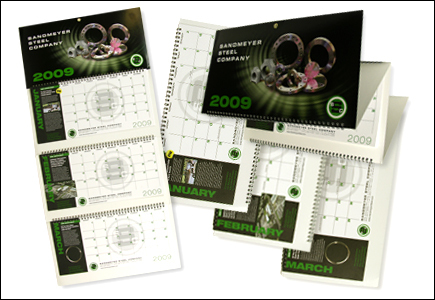 The calendar design was highly customized, offering space for featured product information. A wire binding for collating and a gold grommet for hanging finish off the design, making it stand out in any manufacturing organization – whether in the office or on the floor. This is one calendar that is sure to be hung in every business that received it.